The Flaming Moe debuted on "The Simpsons" in 1991 and it has been a drink that many people have since tried to recreate. There really is no "real" recipe for it, but there are a few common mixes and this recipe is one of the better tasting options. The "Flaming Moe's" episode (Season 3, Episode 10, 1991) is one of the most popular and talked about in the long life of the TV show. In the episode, Homer created the drink and called it the Flaming Homer. Moe stole the recipe, renamed it the Flaming Moe, and it became a hit in his bar. The drink has been a weird phenomenon ever since. If you're going to try it, it should go without saying that high-proof rum is preferred over the cartoon's cough syrup! Pour all ingredients except the rum in a highball glass. Float the rum on the top. Ignite with a match and extinguish before drinking. "I decided to mix the little bits that were left in every liquor bottle. In my haste, I had grabbed a bottle of the kids' cough syrup." He blends up the mix and says, "It passed the first test: I didn't go blind." Homer joins the family on the couch and his sister-in-law Patty's cigarette drops into his glass, igniting it in flames that reached the ceiling. After his next sip Homer says, "I don't know the scientific explanation, but fire made it good." In true Homer Simpson fashion, you really should be making this drink out of the droppings left in your liquor cabinet. You can order a Flaming Moe at Moe's Tavern inside the Universal Studios Florida theme park. However, you will actually get an orange soda-like drink served over dry ice for a smoky, bubbling effect. Fun, but no booze...sorry, it's kid-friendly! Can You Flame Cough Syrup? Let's just remember that "The Simpsons" is a fictional show and it is a cartoon. As any fan knows, Krusty's products were not always the safest either. Cough syrups in the real world do not have enough alcohol to catch on fire. NyQuil Liquid has just 10 percent alcohol and that's one of the strongest available. 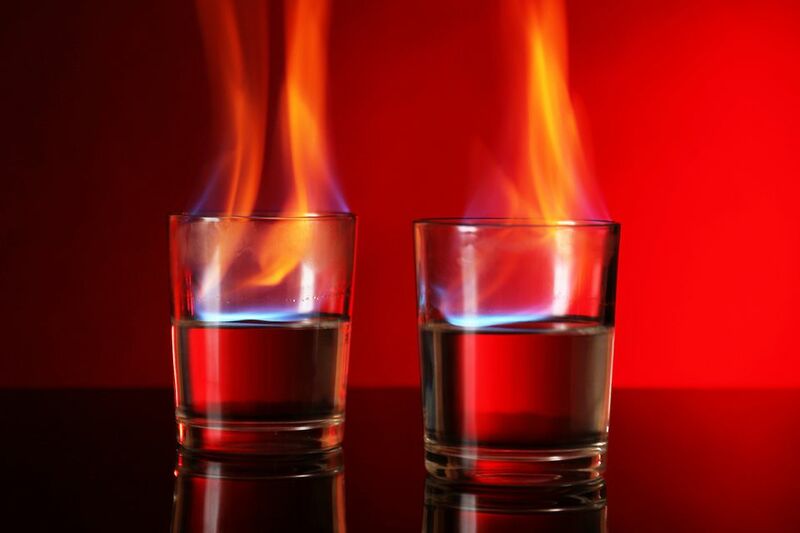 If you have ever made a flaming drink, then you know that a 151-proof rum is typically used to top it off. That is 75.5 percent alcohol by volume and a big difference from the likes of NyQuil. How Strong Is a Flaming Moe? You can certainly try to drink a Flaming Moe in one shot, but it's a very tall drink, mixing up to about 5 ounces. Plus, with all that liquor, it's very strong with an alcohol content around 27 percent ABV (54 proof). To put that in perspective, it's like drinking a B-52 shot, only a lot more to get down in one swallow!